24.03.2011*/Austria/ Pogush/ near Gasthaus "Steirereck" - A Schweizer 269C (Hughes 300) helicopter (OE-XCG) crashed on landing injuring slightly the 3 occupants. */US/ TN/ Franklin County - An expeerimental glider crashed injuring the pilot. */US/ ME/ Clear Lake - A Cessna A185F Skywagon plane, operated by Department Of Inland Fisheries And Wildlife, crashed killing the pilot. */Australia/ Pigeon Island/ about 160km north-west of Geraldton - A small airplane overshot the runway into the ocean on landing. The 2 occupants have suffered minor injuries. */Chile/ Maule/ San Clemente - A firefighting Bell 205 (conv. Bell UH-1H) helicopter (CC-CMF) crashed killing the pilot (54) and injuring the co-pilot (38). 26.03.2011*/US/TX/Austin - Texas first lady Anita Perry was uninjured when the right engine caught fire on a World War II-era plane that was taxiing for takeoff with her aboard. The B-25 was performing at a small air show in Encinal. 27.03.2011*/US/ FL/ St. Petersburg/ Albert Whitted Airport - A T-28 Warbird reported mechanical difficulties then crashed into the water off Albert Witted Airport as it attempted a landing Sunday afternoon. The pilot and a passenger were rescued and treated for minor injuries. */US/ FL/Miami Beach/ 20 miles off the coast of South Florida - An Enstrom 280FX Shark helicopter made an emergency landing at the ocean. */US/ MO/ Ripley County/ Fairdealing - A Piper PA-28 plane with 3 occupants missing. */Italy/ Grosseto/ Monte Argentario/ off Pozzarello coast - A Robinson R44 Raven II helicopter (I-HEHL) ditched off Pozzarello coast. No injuries. 28.03.2011*/US/ TX/ Canadian - A Cessna 425 Conquest I plane (N410VE) blew one of its tires on landing and crashed injuring slightly 4 of the 7 occupants. 29.03.2011*/US/ 2 miles offshore from Kanehoe Marine Corps Base Hawaii - A military Sikorsky CH-53D Sea Stallion helicopter from Kaneohe Marine Corps Base Hawaii has crashed in the ocean inside Kaneohe Bay. One of the patients was in "extremely critical condition" and died in hospital of his injuries 3 of the crew are hurt. */US/ MI/ Monroe/ Munson Park near Custer Airport (KTTF) - A Piper PA-46-350P Malibu Mirage plane (N619VH) crashed on approach killing the 3 occupants. */US/ MO/ Kansas City's Charles B. Wheeler Downtown Airport - A Piper PA-24 Comanche plane made a belly landing. 30.03.2011*/US/ CA/ off coast San Diego - A Marine Fighter Attack Training Squadron 101 F-18C Hornet based at Marine Corps Air Station Miramar, while getting ready for departure from the aircraft carrier USS Stennis (CVN-74) - had an engine explosion and fire - injuring 11 sailors- 4 flown to hospitals in San Diego. Mostly burns - but none said to be life threatening. */Germany/ Straubing-Wallmuhle - EDMS - A Robinson R44 Raven II helicopter (D-HBLT) touched a hangar at Straubing-Wallmuhle Airport (EDMS), crashed and caught fire. The hangar was substantial damaged. The pilot received minor injuries. */Switzerland/ UR/ Maderanertal - Swiss Air Force Eurocopter TH98 Cougar helicopter (T-341) crashed in mountainous terrain (2300 m above sea level) in the Canton of Uri. The two severely injured pilots and the injured loadmaster were rescued and flown to hospitals. */Austria/ near Achenkirch/ Achensee - An Eurocopter EC135P2i (OE-BXF) crashed during a border inspection flight. All four occupants were killed. 31.03.2011*/Ukraine/ Zhytomyr Region/ Dibrov - An Antonov An-2 plane (UR-54873) flipped over on landing. No injuries. */Venezuela/ Guarenas - A Robinson R44 Raven I helicopter (YV2414) hit mountain and crashed injuring slightly the 4 occupants. Товарен самолет на авиакомпанията Trans Air Congo, излетял от столицата на страната Бразавил, се разбил при подход за кацане в Пуерт-Нуаре. Ан-12 (TN-AGK) паднал в района на жилищен квартал , в резултат на което частично са разрушени около 20 дома, в това число и здание на училище. На борда на самолета са се намирали 4- членен екипаж и 5-ма пътници. Посолството на РФ в Бразавил подтвърждава гибелта на тримата руснаци - членове на екипажа в катастрофата. Загинал е и вторият пилот, гражданин на Казахстан.. Общо загиналите до момента са 23-ма, а ранените 14. Според очевидец екипажът на самолета се опитал да избегне падането на самолета върху жилищните сгради като в определен момент от подхождането за кацане се е насочил към морето. Грузовой самолет авиакомпании Trans Air Congo, вылетевший из столицы страны Браззавиля, упал при заходе на посадку в Пуэрт-Нуаре. При этом сообщается, что Ан-12 (TN-AGK) упал на жилой квартал города, вследствие чего частично разрушенными оказались около 20 домов включая здание школы. На борту самолета находились четыре члена экипажа и пять пассажиров. Посольство РФ в Браззавиле подтверждает гибель троих россиян в катастрофе. Это первый пилот Иван Панин, штурман Николай Курятник и бортмеханик Леонид Жаворонков. Погиб также второй пилот - гражданин Казахстана Айджан Айкалиев. Сообщили о 23 погибших и 14 раненых. Экипаж самолета сделал все возможное, чтобы избежать падения на жилые кварталы города. Конголезские власти ведут расследование ЧП. A Trans Air Congo Antonov AN-12, registration TN-AGK performing freight flight from Brazzaville to Pointe Noire (Congo) with 5 passengers and 4 crew, impacted buildings in the residential area of Mvou-mvou while on approach to Pointe Noire's runway 17 after having been cleared to land by the control tower. 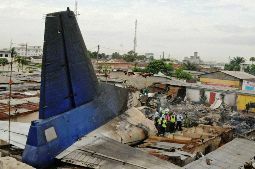 The airplane burst into flames, all on board perished, 23 bodies and 14 injured have been recovered from the crash site, about 20 buildings were destroyed or damaged. 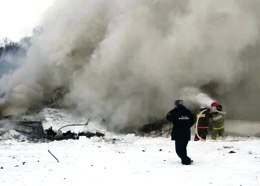 The plane crashed in an area that includes the district mayor's office, the offices of a television station, a private elementary and secondary school and a popular stadium. One witness told that the city was "in shock. It's apocalyptic." Another witness said the plane had begun preparing to land at the airport before veering out to sea and then crashing. 07.03.2011*/Colombia/ Tolima/ Melgar - Two Colombian Air Force (FAC) UH-1H helicopters collided in mid-air. One of them, FAC-4501, did a relatively controlled descent and its 4 crew members were injured. The other, FAC-4506, crashed and caught fire killing all 5 on board. 08.03.2011*/US/GA/Henry Co/Hampton/near Tara Field - A DHC-6 Twin Otter 100 skydiving plane (N157KM) crashed immediately after takeoff killiing the 2 occupants. */UK/ England/ Cumbria County/ Borrowdale - An Aerospatiale SA.341G Gazelle helicopter (HA-LFB) crashed killing the pilot. */Brazil/ MT/ Paranatinga - An agricultural Embraer EMB 202 Ipanema plane (PT-VJU) crashed killing the pilot. */Switzerland/ Lausanne-La Blecherette Airport (LSGL) - A Privair Piper PA-46-500TP Meridian plane (N747AW) damaged in runway excursion on landing. */US/ CO/ Meeker - A Hughes 369D helicopter crashed during a deer-netting operation for the Colorado Division of Wildlife. The 2 occupants suffered minor injuries. 09.03.2011*/US/ CA/ San Bernardino County/ Ludlow - A pilot heading from California to Georgia in a homebuilt plane has crashed and died. 11.03.2011*/Peru/ San Andres - Peruvian Air Force Slim light plane crashed on landing injuring both pilots. */Ukraine/ Kiev/ Vasylkiv Air Base - A training Tecnam P2006T plane (UR-ITD) crashed on landing killing the 4 occupants. 12.03.2011*/US/ TX/ Brownsville-South Padre Island International Airport - A husband-and-wife aerobatics team is hospitalized after they were forced to make an emergency landing during Air Fiesta 2011 taking place at the Brownsville-South Padre Island International Airport Saturday afternoon. Kyle Franklin was able to make a crash landing, but then the WACO UPF-7 plane (N2369Q) caught fire. Both of the Franklins suffered burns to 60 to 70 percent of their bodies. */Germany/ Buttstadt - A Tecnam P92 plane (D-MRBV) made an emergency landing in a field and overturned injuring slightly both occupants. */Portugal/ Espinho Airfield - A Cessna 172N Skyhawk plane (CS-DIN) crashed on landing due to strong winds and rain. The 3 occupants were injured. 13.03.2011*/Germany/ Twistringen - An ultralight plane made an emergency landing in a field after engine failure and overturned. No injuries. */Germany/ Birenbach - A powered paraglider crashed due to an engine failure killing the pilot. 16.03.2011*/Germany/Rendsburg-Eckernforde - A Robin DR.340 Major plane (D-EGMD) made an emergency landing due to an engine failure and crashed. 17.03.2011*/Colombia/ Bogota - A Patrulla Aerea del Pacifico Cessna 177RG Cardinal RG plane (HK-1045-G) crashed on landing injuring the 2 occupants. 18.03.2011*/Bolivia/Rurrenabaque Airport (RBQ/SLRQ) - A Xian MA60 plane (FAB96) suffered minor damage during a belly landing accident. 19.03.2011*/US/FL/Gainesville airport - A Gainesville man who crashed his single-engine experimental plane nose-first Saturday morning at Gainesville Regional Airport was hospitalized with non-life-threatening injuries. */US/ AZ/ Mesa - A pilot and two passengers escaped injury after their small plane, Cirrus SR22, crashed at Mesa's Falcon Field. */US/ WA/ Puyallup Airstrip - A single propeller Cessna 206 Civil Air Patrol plane hit short of the runway while attempting to land and flipped over onto its top just before noon Saturday. No injuries. */South Korea/ Seosan, some 277 kilometers south of Seoul - A forestry helicopter crashed into a reservoir Saturday, leaving one crew member dead. */Spain/ Aragon region/ Teruel/ Camarena - A firefighting Bell 407 helicopter (EC-KTA) crashed killing 6 and injuring seriously 1 of the 7 occupants. */US/ SC/ Greer - Unregistered ultralight crashed killing the pilot. 20.03.2011*/US/ WI/ some 15 miles southwest of Baraboo - A Cessna 150D plane (N4178U) crashed killing the 2 occupants. */New Zealand/ N. of Auckland/ about 800 metres off Orewa Beach - An amateur built Pereira GP-4 plane (ZK-JPE) crashed into the sea killing the pilot. */US/ AL/ Lincoln/ Eastland Shores community - A helicopter crashed due to an engine failure. No injuries. */US/ MA/ Oak Bluffs/ Martha's Vineyard - A Piper PA-32R-300 Lance plane (N2027M) made a forced landing on the beach due to an engine trouble. */France/ Courchevel Airport - LFLJ - A Piper PA-32RT-300 Lance II plane (N220BK) made a belly landing. 21.03.2011*/US/ UT/ Spanish Fork-Springville Airport - A Cessna-172 plane (N73906) crashed on landing due to a gust of wind. The pilot sustained serious injuries. Загинали са всичките шестима души на борда на самолет "Ан-148" с регистрационен номер RA-61708, който се разби при изпитателен полет на 165 км от Белгород. Самолетът е трябвало да бъде доставен в Миянмар и затова при изпитателния полет на борда е имало двама летци от тази страна . Бил подписан договор за доставка на две такива машини, първата през март. Самолетът паднал край село Гарбузово и при удара в земята един от резервоарите се запалил. Жертви на земята няма. Очевидци разказват, че самолетът започнал да се разпада още във въздуха, като първо се откъснало едно от крилата му. Затова и останки от самолета могат да се намерят на разстояние от 3 км по изминатия маршрут от момента на инцидента до сблъсъка му със земята. Самолетът е собственост на воронежкия авиационен завод. До катастрофата е имал 31 полета. Ан-148-100Е е граждански самолет за полети на разстояние до 3600 км с капацитет от 85 пътници и крейсерска скорост 820 км/ч. Изпитанията му започнали през декември 2004 г. Изпълнява редовни полети по маршрута Киев-Харков от 2009 г.
Самолет Ан-148-100Е (RA-61708), принадлежащий Воронежскому авиационному заводу (ВАСО), утром 5 марта вылетел с аэродрома "Придача" в Воронеже для проведения летных испытаний по маршруту Воронеж - Рогачевка - Лиски - Россошь - Гредякино - Острогожск - Воронеж. Около 10.40 мск с лайнером пропала связь. Вскоре было обнаружено, что самолет упал в 8 километрах северо-восточнее деревни Гарбузово Алексеевского района Белгородской области. Находившиеся на борту Ан-148 четыре члена экипажа и двое граждан Мьянмы погибли. Самолет начал разваливаться еще в полете, и обломки Ан-148 разбросало на расстоянии 3 километров от места крушения. У упавшего самолета взорвался один бак, взрыв второго бака удалось предотвратить. По данным пресс-службы ОАО "Объединенная авиастроительная корпорация", Ан-148-100Е готовился для поставки в Мьянму по контракту. В феврале Воронежскому авиационному заводу завершил летные испытания самолета. Корпорация сообщает, что Ан-148-100Е №61708 выполнил 31 полет без замечаний, влияющих на безопасность воздушного судна. В момент падения самолета на борту лайнера проходили обучение пилоты Мьянмы. По факту крушения самолета возбуждено уголовное дело. Расследованием причин катастрофы будет заниматься и комиссия Минпромторга России. A passenger jet that Russia was to deliver to Myanmar crashed during a training flight on Saturday, killing its Russian crew of four and two pilots from Myanmar. The An-148-100E, registered RA-61708, crashed in the Belgorod area, some 600 km (370 miles) south of Moscow, the Emergency Situations Ministry and the state-controlled United Aircraft Corporation said. The pilots from Myanmar were undergoing training aboard the plane, one of two aircraft being sold to Myanmar’s government under a 2010 contract, UAC said. A company spokesman said it was unclear who was at the controls or what might have caused the crash. The plane had completed 31 test flights since it was built and no safety problems had been discovered, UAC said. Myanmar’s embassy in Moscow declined immediate comment. The An-148-100E is a regional jet that can carry 85 passengers and has a range of 3,600 km (2,730 miles), according to UAC, which said the jet that crashed was fitted out as a passenger plane. Myanmar’s government is dominated by the military. 01.03.2011*/Sri Lanka/ Gampaha/ Warana - One of the two pilots in the Sri Lankan air force Kfir jets has been found dead after the planes collided Tuesday morning, air force spokesman said. The two Kfir jets clashed over Warana area in the western provincial Gampaha district while on a training exercise in connection with the air force's 60th anniversary celebrations, which are to begin on Wednesday. */France/ Creuse/ Saint-Oradoux-pres-Crocq - French Air Force Dassault Aviation Mirage 2000N crashed during a night training flight killing the 2 pilots. 02.03.2011*/Italy/ Forli Airport - A Cessna C-550 Citation S/II plane (S5-BAX) crashed on takeoff. No injuries. The aircraft, which operated a flying ambulance (with a heart for transplant), has been damaged. */Czech Republic/ about 25km from Prague/ Kladno district/ Slany airfield (LKSN) - A training police Eurocopter EC-135T2 helicopter (OK-BYD) crashed on landing. No injuries. 04.03.2011*/Greenland/ Godthab/Nuuk Airport (GOH) - Air Iceland de Havilland Canada DHC-8-106 plane (TF-JMB) sustained substantial damage in a landing accident. The right hand main gear collapsed when the aircraft was on the runway. The aircraft went off the right side of the runway after the right wing hit the runway. The nose landing gear broke of when the aircraft struck a rocky embankment. */Jamaica/ Kingston - A training Cessna 152 plane (6Y-JGA) overshot the runway and ended on the roadway injuring slightly both occupants. */Mexico/ Jalisco/ El Carrasqueno - A Cessna 411 plane (XB-LWA) attempted an emergency landing, but struck wires and crashed on a pasture killing both pilots. Two passengers suffered significant burns. Two cows were killed as well. 05.03.2011*/Libya/ Ras Lanuf - Libyan Air Force helicopter shot down in the sea. */US/ MI/ Charlevoix/ Boyne Mountain Airport - The pilot was coming in from Ohio when he says his landing gear collapsed. The plane slide about 1,000 feet before stopping on the left side of the runway. No injuries. */Saint Vincent and the Grenadines/ Union Island, Grenedines - A Beech 200 Super King Air plane (YV196T) crash-landed due to a high winds.